This was the original from 10 years ago...lots of wallpaper and smoke/water damage. We removed the overhead cabinets over the peninsula and refreshed everything the best we could at the time, but we were overwhelmed with the rest of the house we really did the bare minimum to the kitchen as the stove top was in need of replacing at a whopping $3600 to use the existing counter tops or go smaller and replace for about the same if we went laminate. We just made it work for the last 10 years. 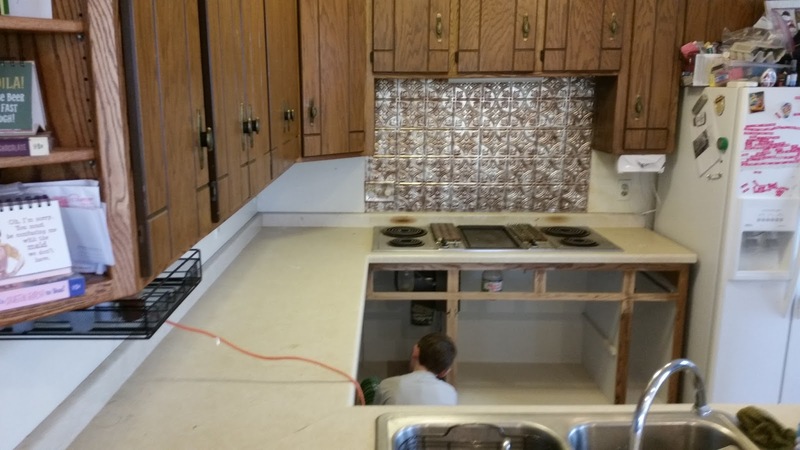 This is one of many of the renovation process...yes it started as a oh lets paint the inside of the cabinets and went to the whole lets ripe stuff out and restain what is here. This is the undecorated version...The EAT sign has some other friends and they all hang out above the corner cabinets...but this was the last picture I took of it clean...hahahaha. I updated the painted backsplash/ copper (behind the stovetop) with a more modern tile like smart tiles. They were semi easy to work with and cost wise cheaper than real tile as not grout and less labor intensive. I did the whole thing in an afternoon. John being the all around fix it that I need him to be updated the stained outlet plugs for me. Cheap labor is the best. Yes I love my Waterlox counter tops. John cut the sink/ stove top and lengths for me as well as securing them to the bases. I did the sanding and coats of Waterlox. They have dulled some, as they are almost all the way cured, but I love the fact that water can sit on them and no water stains. They do have a few scrapes and scratches, but I expected that from the get go. I would totally do butcher block tops again. We cut off the raised bar and made it all one height. It makes for a more open kitchen and the extra usable space is amazing! We replaced the old stove top, the dishwasher, sink and faucet, counter tops and added the hood fan. All for well under what the replacement stove top for the 46" would have been. We painted all of the shelving and insides white. John added a few shelves in the lower corner cabinets as we took out the lazy susan 10 years ago and were just using plastic shelving. I added some pull out baskets to be able to see the stuff in the deep pantry and for plastic container storage. And to help get the "stuff" off my counter tops I redid this island my aunt had into a side board/ bar. It's my wake up and evening drink stop all in one. Coffee pods and bar supplies are in the pull out drawer.